This article is about the card. 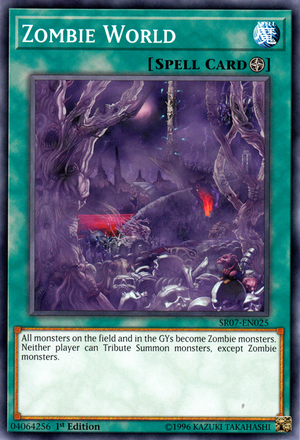 For the TCG Structure Deck, see Zombie World Structure Deck. For the OCG Structure Deck, see Structure Deck: Undead World. All monsters on the field and in the GYs become Zombie monsters. Neither player can Tribute Summon monsters, except Zombie monsters. Monde Zombie Tous les monstres sur le Terrain et dans les Cimetières deviennent des monstres Zombie. Aucun joueur ne peut Invoquer par Sacrifice de monstres (monstres Zombie exclus). Zombiewelt Alle Monster auf dem Spielfeld und in den Friedhöfen werden Zombie-Monster. Kein Spieler kann Monster als Tributbeschwörung beschwören, außer Zombie-Monstern. Mondo Zombie Tutti i mostri sul Terreno e nei Cimiteri diventano mostri Zombie. Nessun giocatore può Evocare mostri tramite Tributo, eccetto mostri Zombie. Mundo Zumbi Todos os monstros no campo e nos Cemitérios se tornam monstros Zumbi. Nenhum duelista pode Invocar monstros por Invocação-Tributo, exceto monstros Zumbi. Mundo Zombie Todos los monstruos en el Campo y en el Cementerio se convierten en monstruos Zombi. Ningún jugador puede Invocar monstruos por Sacrificio, excepto monstruos Zombi. 언데드 월드 ① : 필드의 앞면 표시 몬스터 및 묘지의 몬스터는 전부 언데드족이 된다. ② : 서로 언데드족 몬스터밖에 어드벤스 소환할 수 없다. This page was last edited on 17 January 2019, at 11:00.